27.4 mm stainless steel case, scratch-resistant sapphire crystal, black dial, quartz Omega 1376 movement, approximately 41 months of power reserve, stainless steel bracelet. Water resistant to 30 m.
27.4 mm stainless steel case, scratch-resistant sapphire crystal, white dial with polished Roman numeral hour markers and cabochons, Omega 1376 quartz movement with rhodium-plated finish, stainless steel bracelet. Water resistant to 3 bar (30 metres / 100 feet). 27.4 mm stainless steel case, scratch-resistant sapphire crystal, white silvery dial with a silk-like pattern and an opaline finish, Omega 1376 quartz movement with rhodium-plated finish, stainless steel bracelet. Water resistant to 3 bar (30 metres / 100 feet). 27.4 mm stainless steel case, sapphire back, stainless steel bezel, domed scratch-resistant sapphire crystal, blue dial with diamonds, caliber 1376 quartz movement with scratch-resistant sapphire crystal, approximately 48 months of power reserve, stainless steel bracelet. Water resistant to 3 bar. 27.4 mm stainless steel case, domed scratch-resistant sapphire crystal, sun-brushed and lacquered blue dial with a layered OMEGA teddy bear pattern, Omega 1376 quartz movement with rhodium-plated finish, stainless steel bracelet. Water resistant to 3 bar (30 metres / 100 feet). 27.4 mm steel case, steel bezel, sapphire crystal with anti-reflective treatment inside, white dial with red gold-coloured roman numeral hour markers and diamond indexes, caliber 1376 quartz movement with rhodium-plated finish, approximately 48 months of power reserve, steel bracelet. Water resistant to 30 m (100 ft). 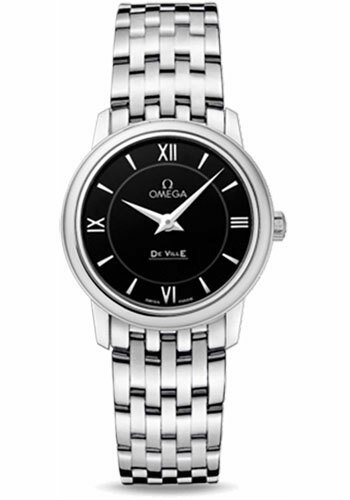 27.4 mm stainless steel case, scratch-resistant sapphire crystal, grey dial with a silk-like pattern and an opaline finish, Omega 1376 quartz movement with rhodium-plated finish, stainless steel bracelet. Water resistant to 3 bar (30 metres / 100 feet). 27.4 mm steel case, steel bezel, sapphire crystal with anti-reflective treatment inside, blue dial with roman numeral hour markers and diamond indexes, caliber 1376 quartz movement with rhodium-plated finish, approximately 48 months of power reserve, steel bracelet. Water resistant to 30 m (100 ft). 27.4 mm stainless steel case, scratch-resistant sapphire crystal, white silvery dial with a silk-like pattern and an opaline finish, Omega 1376 quartz movement with rhodium-plated finish, hunter green leather strap. Water resistant to 3 bar (30 metres / 100 feet). 27.4 mm stainless steel case, scratch-resistant sapphire crystal, grey dial with a silk-like pattern and an opaline finish, Omega 1376 quartz movement with rhodium-plated finish, blue leather strap. Water resistant to 3 bar (30 metres / 100 feet). 27.4 mm stainless steel case, diamond bezel, scratch-resistant sapphire crystal, silver dial with 8 diamond hour markers, quartz Omega 1376 movement, approximately 41 months of power reserve, stainless steel bracelet. Water resistant to 30 m.